Your search for a cleaner, healthier shower is finally over. When you receive your package from Amazon, take out your new Aqua Elegante High Output Luxury Shower Filter from the cute, little color box and admire the elegant design. You have in your hands a high-quality, eco-friendly filtration system that neutralizes chlorine and heavy metals lurking in your water. Now twist the filter on to your shower arm and install the shower head. Flush the filter with water to prep. That's it. You're now ready to take a shower. Turn on the shower and allow the dechlorinated, mineral-free water to wash over you. Notice how much softer the water feels. Take a deep breath and see how the shower no longer wreaks of chlorine. All you can smell is the vivid scents of your soap and shampoo. 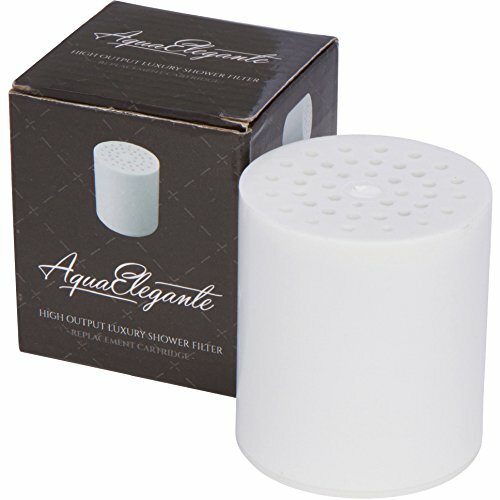 What separates the Aqua Elegante shower filter from the competition? It's simple really. It starts with our choice for filter media. We use a specialized blend of granulated activated carbon with a high-purity copper-zinc alloy known as KDF-55. Activated carbon traps herbicides, pesticides, chlorine, and other impurities through adsorption. KDF-55 eliminates hydrogen sulfide, lead, mercury, arsenic, and other metals through a chemical redox reaction. These compounds are known carcinogens that can absorb through your skin. That's why naturopaths and health experts recommend using a high-quality shower filter to remove them. Just knowing the filter is taking out the chlorine is comforting. And you can feel the difference. It's because of this that we're able to make a guarantee unlike any other you've seen. Try our High Output Luxury Shower Filter for 6 months. If you're not shocked by how much cleaner your shower feels, we'll give you back your full payment, no questions asked. You're protected if you used the filter for 1 day or for 6 months. That's how confident we are you'll be happy and keep coming back for more! REMOVES HEAVY METALS - KDF 55 purification media rids water of heavy metals that stain your bathtub and inhibits the growth of scale, lime, mold, and fungi - without sacrificing water pressure. REDUCES CHLORINE - 90-95% reduction. Enjoy fewer flare-ups, fresh showers, and healthy, smooth skin. REJUVENATES HAIR - Glide your comb/brush through your hair once again. Fewer tangles. Less damage. REPLACEMENT CARTRIDGE ONLY - Cartridge is designed for our High Output Luxury Shower Filter. This cartridge will not work with other shower filter brands; and it will also not work with other Aqua Elegante shower filter models. You can contact us if you have any questions on which replacement cartridge to order. LASTS 6 MONTHS - ~12,000 gallons. Some report longer. But we guarantee 6 months or your money back. If you have any questions about this product by Aqua Elegante, contact us by completing and submitting the form below. If you are looking for a specif part number, please include it with your message.